MIDI Interfaces manage the MIDI data into your home recording studio... and I know you're itching to get as much MIDI into your life as quickly as possible. And if this is actually true then you are in luck, because MIDI capability is one of the easiest additions you can make to your studio. Sometimes it can be as easy as the classic "adapter cable". 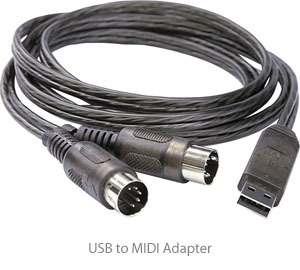 The "Y" cable has a USB connector on one end and 2 MIDI connectors on other, with 1 for the input and 1 for the output. New MIDI controllers have a USB option built right in, with the added bonus being that you don't need an external power cord or batteries as it can run off the power of your computer. The drawback here is that you can only have as many MIDI I/O as you have USB ports on your computer. If you only have one keyboard synthesizer, drum machine, or other MIDI controller then there is nothing wrong with going this route. This would only become a problem as your studio grows on down the road, but only you can judge if this is an issue for you. I personally have both USB and MIDI devices in my setup and I can tell you that it's totally transparent when using them which one is which. To me it comes down to the logistics of available ports and not sound quality in any way. If you have many devices you'd like to include then maybe the dedicated hardware MIDI interface is for you. The hardware option can have several MIDI I/Os (e.g. 5 MIDI In and 5 MIDI Out) with only 1 USB required for data transmission and power. This certainly gives you some more options for expansion later on, but this is also an example of how we can get carried away. Really think about how much MIDI you're planning to use. This may be a better application for a live situation where several hardware synths are used at once. That being said, this is the MIDI interface that I use in my own studio. Now I could get by without it, but that would mean a lot of cable swapping depending on which MIDI device I was using that day. So now between my hardware synth, digital piano, and drum machine I can have them all instantly available should I get the urge to use any of them. Yet another option is to get an Audio Interface with a MIDI I/O. Many AIs will have the 2 MIDI input/output ports required to have 1 controller hooked into your rig. Remember that MIDI is a one way street, as far as cabling is concerned, so if you want to hook up 1 synth you will need 2 cables... one each for the input and output. But also remember (going back to the first part of our discussion) that USB is a 2 way street. In other words, even though it takes a USB port up it can provide input and output data via the 1 cable. I can tell you this is a nice thing to have when using multiple MIDI devices because the cables really can get out of control quickly... sometimes "snakes nest" doesn't even to begin to describe it. However, for most users, one keyboard synth or other type of MIDI controller will be all you need so this may not be a big deal at all. So you can see there are many options to choose from. 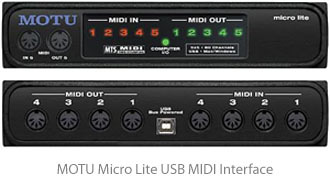 MIDI interfaces are an easy and inexpensive addition to your setup, and can provide a lot of powerful capability. Now there can be no excuses for not having MIDI in your life. I bet you feel better already!